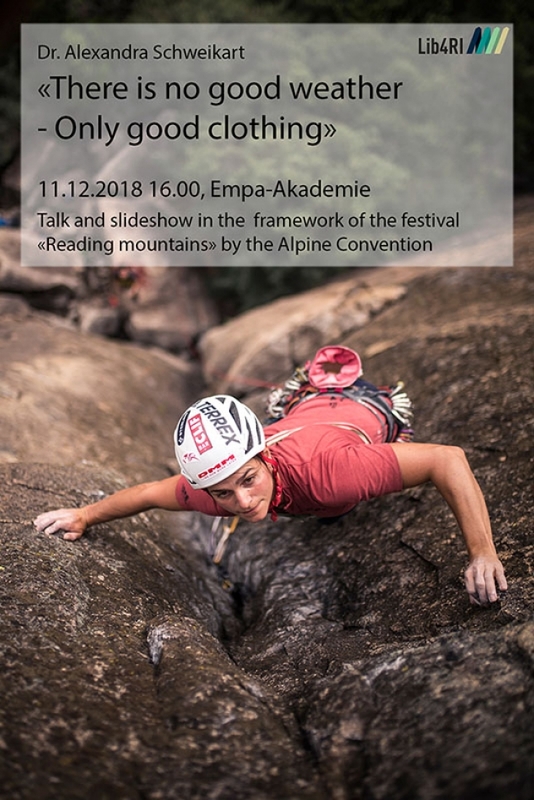 Lib4RI has invited Dr. Alexandra Schweikart for a talk and a slide show in the framework of the festival «Berge lesen» organized by the international Alpine Convention. Being one of Germany’s top female alpine climbers she is no stranger to hard big-walls on El Capitan in Yosemite and the Alps. Nevertheless, as a specialist on textiles, she also knows the science behind the gear she is using. Her talk will partly cover the science behind it, but she will also share a lot of her personal experience with these materials in the mountains. What do hemp ropes and knitted cotton undershirts have in common? Exactly: They are hardly in use anymore in modern mountaineering and were replaced by modern fibres from the laboratory. These fibres are utilised in many areas: For clothing, but also for safety and climbing equipment like ropes or climbing harnesses they can perform at the highest level. One and the same fibre is able to transport microscopic perspiration molecules in a hard shell jacket or it can hold several tons of weight when it is tightly woven. If a jacket is badly worn and not watertight anymore it is totally clear that it should be replaced. But what about the climbing equipment made from fibres? There is no service lamp that starts glowing as soon as a certain level of wear is reached and the equipment has to be checked. Or is there? This and other questions will be answered in the talk.